In the Unicorn's latest show for under fives they welcome back the world's friendliest polar bears after their first outing last year, in The Polar Bears Go Wild. The Polar Bears Go Up is intelligent, absorbing and inclusive. A gentle story told entirely through mime this is the perfect antidote to noisy panto. Creators and performers Eilidh MacAskill and Fiona Manson really know their very young audience. An energetic double act, they introduce themselves and their story very slowly with precise movements, playful visual jokes and bright smiles. At first we just watch them sniff each other, scratch their backs and then progress to making breakfast. Nothing is rushed, the actors taking their time to enjoy each sequence which allows the kids to do the same, getting used to these strange fluffy creatures complete with face make-up and ski-goggles on their heads. As every teacher knows, the best way to attain silence among children is be quiet yourself. By choosing not to talk at all, MacAskill and Manson set the tone in the room. It also means that the very youngest aren't left behind as the pair take them on a carefully choreographed journey into space. A sense of joyful discovery runs throughout this delightful piece, the quirky ideas, set surprises and cheeky grins of the polar bears ensuring that little minds don't wander. In fact when we saw it, one child in the front row was so engaged she kept trying to join them in their space ship. Unflustered by such distractions, MacAskill and Manson react enthusiastically to the kids' excitement, often getting in a knowing look meant only for the adults. The polar bears discover the huge world around them with a childish sense of wonder, It's no surprise tickets to join them on their adventures are selling out quickly. 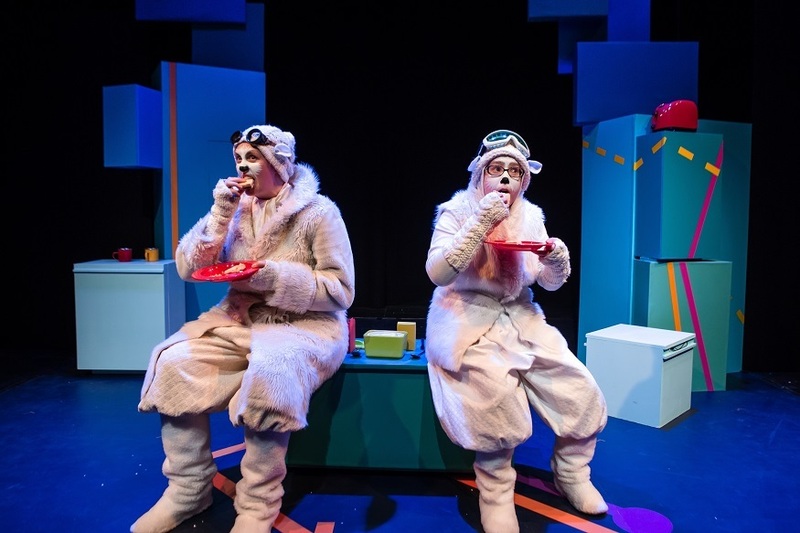 The Polar Bears Go Up is on at the Unicorn Theatre, 147 Tooley Street, SE1 2HZ until 1 May. Tickets £16 adults, £10 under 18s with a 20% discount for family groups. This production is suitable for 2-5yrs. Londonist saw the show on complimentary ticket.